In 1853 Robert Schumann identified fully-formed compositional mastery in the young Brahms, who nevertheless in the years following embarked on a period of intensive further study, producing, among other works, the neo-baroque Sarabande and Gavotte. These dances have not been properly recognized as constituting a distinct Brahms work before now, but manuscript evidence and their performance history indicate that Brahms and his friends thought of them as such in the mid-1850s, when they became the first music of his performed publicly in Gdansk, Vienna, Budapest and London. He later suppressed the dances, using them instead as a thematic quarry for three chamber music masterpieces, from different stages in his life and in distinctly different ways: the Second String Sextet, the First String Quintet and the Clarinet Quintet. This book gives an account of the compositional and performance history, stylistic features and re-uses of the dances, setting these in the wider context of Brahms’s developing creative concerns and trajectory. It constitutes therefore a study of a ’lost’ work, of how a fully-formed master opens himself to ’the in-flowing from afar’ (in Martin Heidegger’s terms), and of the transformative reach and concomitant expressive richness of Brahms’s creative thought. Contents: Preface; The Sarabande and Gavotte; The Second String Sextet, op. 36, and its second movement; The First String Quintet, op. 88, and its second movement; The Clarinet Quintet, op. 115; Conclusion; Bibliography; Index. 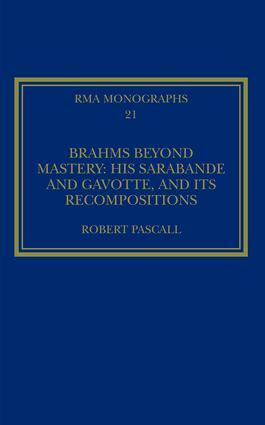 Robert Pascall has written extensively on music from J S Bach to Schoenberg and has edited Brahms’s symphonies for the new Johannes Brahms Complete Edition. He is an Honorary Member of the Royal Musical Association and Honorary Professor of Music Philology at the University of Cambridge. This series was originally supported by funds made available to the Royal Musical Association from the estate of Thurston Dart. Its purpose is to provide a medium for specialized investigations of a topic, concept or repertory - studies of a kind that would not normally be feasible for commercial publishers and that would be too long for most periodicals.